Zookeepers are hoping that the call of family could finally lure back a runaway wildcat which has been missing for five days. Flaviu the lynx has been on the loose since he staged breakout from Dartmoor Zoo on Wednesday night. A search involving a police helicopter, drone and thermal imaging cameras have so far failed to turn up the wildcat. Now experts are to play recordings of his mother's call over Dartmoor in the hope that it will lure him into a humane traps so he can be returned back home to the zoo, police have said. 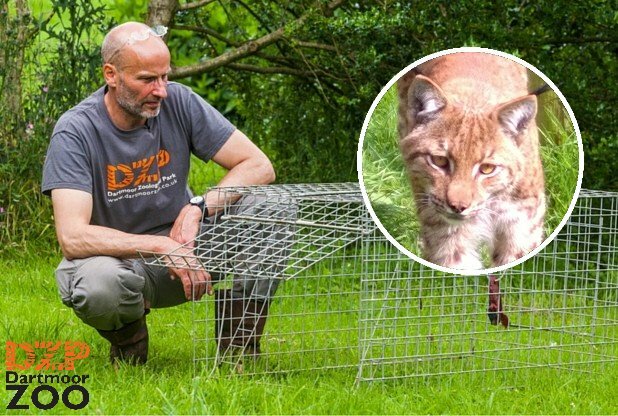 Following several credible sightings of the lynx since it escaped, park staff are confident enough to put into place a humane capture plan concentrating on one area of Dartmoor. Any activity in this area, such as trying to get photographs, runs the risk of alarming the animal and possibly making it move on and thus making it harder to find. The two-year-old lynx managed to escape on his first night after arriving at Dartmoor Zoo. He chewed through a wall and vanished, leaving keepers to find an empty cage in the morning. A major hunt was launched in the countryside for Flaviu, who is only a little larger than a domestic cat. Police have warned that the wildcat "could become dangerous if alarmed or cornered" and should not be approached by the public. However, experts added that he was probably hungry and scared as he struggled to adapt to life in the wild.